The Burgwin-Wright House and Gardens presents Francisca Dekker and her exhibit "Lineal Perspective" at our Fourth Friday Gallery Night event, September 28th from 6 p.m. to 9 p.m. Dekker's vibrant exhibit will be on display until October 20, 2018. Born in the Netherlands, Francisca Dekker pursued a career in social work until she moved to the United States with her husband. Dekker decided to create a new lifestyle upon her move and began discovering her natural talents for the arts. With no formal training, she is able to express herself through her art with no boundaries or judgments. Dekker's art is inspired by people, nature, and music. She expresses her view of the world through her use of various media in her paintings and drawings such as acrylics, watercolor- pastels, and ink. 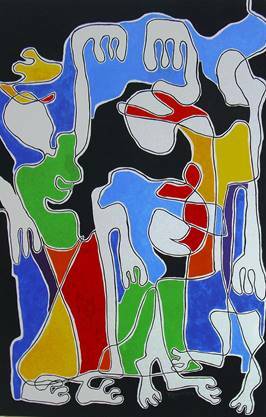 She uses bold colors and fluid lines to represent the human body, resulting in abstract and often whimsical forms. Built in 1770, the Burgwin-Wright House and Gardens is open from 10 a.m. to 4 p.m. Tuesday through Saturday. Guided tours are offered on the hour from 10 a.m. until 3 p.m. Visit www.burgwinwrighthouse.com for more information about Fourth Friday, tours and other special events.